← Giveaway: Choose Which New Release You Want To Win! 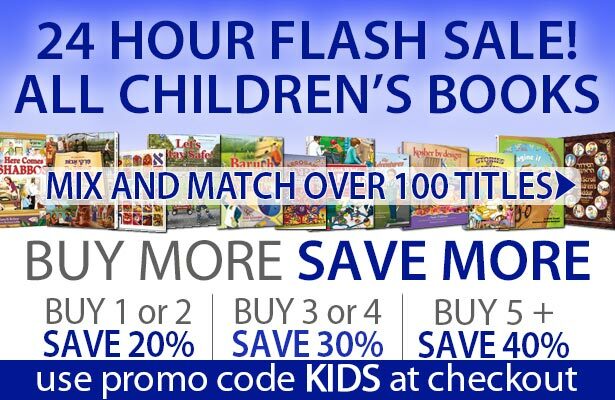 24 Hour Flash Sale: Up to 40% Off ALL Children’s Books! Hurry and shop before it’s too late! Offer ends midnight, June 11th, 2015. There is no limit to this offer, so take advantage of this great opportunity to stock up for your children, grandchildren and gift-giving needs! Keep checking The Official ArtScroll Blog to make sure you don’t miss any of our upcoming flash sales throughout the duration of our June sale! Did you enter the giveaway yet? You could win your choice of new books! Click here to enter. *All discounts off list price. Discount will be reflected in shopping cart. Sale ends midnight, Thursday, June 11th, 2015. Must use promo code KIDS at checkout and select free shipping option.